Empowering you to achieve all of your healthy hair goals. No matter your hair type or texture, there are some challenges that are experienced by everyone with a head of hair. These are the most common complaints amongst individuals when it comes to their hair. Dry hair is a problem that every one of us has experienced at one time or another. Causes of dry hair can range from a too little water intake to too much product buildup to harsh chemicals in hair products. The first question I ask of persons who complain about dry hair is “are you drinking enough water?” To which most people answer “I don’t really drink water”. 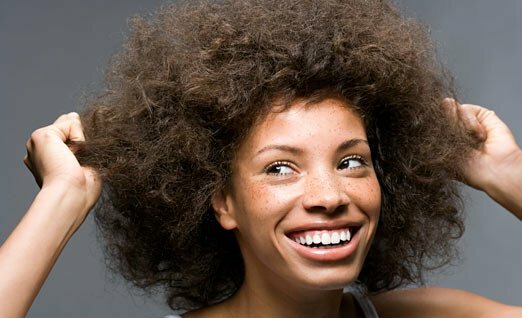 If this is you and you are experiencing dry hair, this is where you need to start. According to Anne Marie Helmenstine, Ph.D, the average adult human body is comprised of on average 50 – 65% water. The percent of water depends on your hydration level. Thirst is a key indicator that you have already lost 2 – 3% of your body’s water. If your body is dehydrated, so is your hair… as within, so without. Remember water = moisture. Be careful not to use too many alcohol based products. Add natural oils to your styling regimen. I always apply my oil to wet hair either before or after my leave in conditioner. The oils I have found work well for me are coconut, jojoba, sweet almond, avocado and grapeseed. Clarify when necessary to dissolve product build-up which can make the hair appear dull and dry. When using protein treatments, be sure to follow up with a deep conditioning treatment. Scheduling a regular trim (every 3 – 4 months) with your stylist will help you to prevent split ends and also aid in maintaining the shape and style of your hair. In between trims it’s a good idea to protect your ends by sealing them daily and wearing protective styles when necessary. Your hair is your crowning glory, it is precious and so you must handle it carefully. When detangling your hair be gentle. I recommend using your fingers to detangle but if this seems like an impossibility for you, you want to remember to detangle gently using a wide tooth comb. Be sure to start at the ends of the hair and work your way up to the roots. Remember that hair is more fragile when it is wet so take care to be gentle with it. This entry was posted in African American natural hair, Bi-Racial Hair, Curly Hair, dry hair, frizzy hair, Healthy Hair, Healthy Hair Care, Long Hair Care, nappy hair, Natural Hair, Natural Hair Care, Natural hair Products, wash n go and tagged damaged hair, dry hair, frizzy hair, get healthy hair now, grow long hair, hair breakage, hair challenges, hair shedding, healthy hair, herbal hair products, natural hair.